The backpack has a lot of Convenience features, a high level of Compatibility and a great Design. Some aspects of the Build Quality could leave the owner wanting, but mostly not in critical areas. The DKS-20 is a great backpack with a lot of features to recommend it, and its flaws are mostly able to be ignored or can be worked around. The DKS-20, especially for the price, is a fantastic deal for most photographers. Unless you have a piece of equipment that eliminates the backpack's Convenience, the Value proposition is incredibly high. The majority of the Design elements on the DKS-20 are well thought-out. The easy access to accessories through the side pockets makes changing lenses on a camera a one-person process, without the need to remove the backpack. You can easily unzip one side and put a lens away, and then unzip the other and remove the other lens. The idea of a customizable interior with something as simple as Velcro is a good idea, though, because of some Build Quality issues, becomes a little bit of a problem. The mesh pockets on the inside of the small pouch, the little pouch on the side and the big pouch on the back are all nice additions. The most unexpected addition is the laptop pocket on the back, which is perfect for traveling with a small editing setup. The main issue we have discovered with the design is the top pocket. The angle of the top, and the surprisingly small bottom of the lid when unzipped create a scenario where it's fairly easy for larger items to fall out. While something smaller, like a lens cap or power cable are unlikely to be a problem, we have had microphones fall out of the pocket upon opening. There are a couple of features of the DKS-20 that set it apart, specifically in terms of Convenience. The first is the side access zippers into the main compartment. They are designed specifically to allow a photographer to change lenses, and put them away, without having to remove the backpack or put the camera down. If a lens is on each side of the backpack, you can easily unzip the empty side and place the current lens in, then zip it up again, unzip the other side and remove the next lens. The second big convenience feature is the tripod carrying pocket. The base folds into the bag when it's not in use, hiding it from view, but when it is needed, you fold the trey out and slide the foot of the tripod into it. Assuming the tripod collapses small, such as the Vivitar MPT-600, it makes carrying the tripod incredibly easy. The last feature that is really convenient is the laptop pocket in the back. Being able to easily carry a laptop along with your photography equipment means being able to edit photos on scene, or makes traveling easier. For working on a show floor at a convention, carrying a camera, lenses and laptop is a lifesaver. The Build Quality of the DKS-20 is above average, but could use some improvement in a few places. The majority of the construction is of great quality. The material that makes up the body of the bag is great, the seams are tight and the zippers are quality. Unfortunately, there are some places that are below quality. The most obvious issue is in the Velcro, which is used in a number of places throughout the bag. The inside of the main compartment, where you keep your large camera accessories, is fully customizable with a series of Velcro tabs. If all of the compartments you build are not filled, the Velcro can let go and the majority of the backpack can collapse. Under the wrong strain, even the bottom of the small compartment, which is also secured with Velcro, can come loose, unleashing memory cards, power cords and video cables into the mix. If either the Velcro were stronger, or the dividers were more firm, this problem would be solved. In addition, there are a few places where non-seam stitching is loose. On the side strap, there are 3 loose threads, the top handle has several and the "tripod foot pocket" tag at the bottom has begun to shred on the side. Luckily, none of the loose threads are in critical areas, and were easily solved with a lighter. The tripod tag is not as easy to solve, but it is completely non-critical, but instead aesthetic. In general, the DKS-20 works exactly as you would hope. The side access doors give the backpack a wonderful camera-specific capability that can aid in on-the-go photography sessions. The adjustable dividers make the interior of the backpack completely customizable, which means that it will work for any camera or set of accessories. 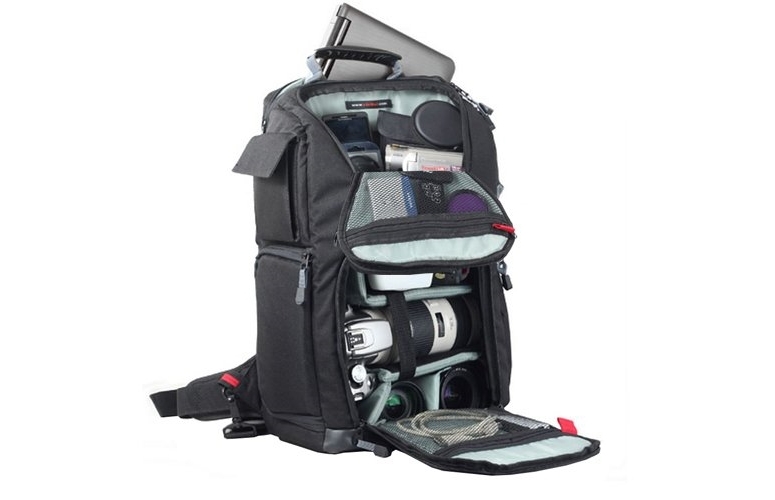 The laptop pocket makes the bag perfect for a photojournalist, especially at an event like CES. As noted in Build Quality, the one part that doesn't function exactly as expected, or hoped, is the Velcro on the dividers. Unfortunately, it does not hold up to heavier equipment and empty pockets. The last trip we used the bag for, not all of our equipment was always needed, and the inner compartments, as well as the base for the small compartment, collapsed. This made traveling back more difficult, as the bag had to be rebuilt from the inside. The size of the DKS-20 may, at first, seem to be a little larger than necessary, but using it will change your mind. The backpack is actually exactly the right size for a photographer or videographer on the move. Having traveled with the backpack, it has proven to be a great travel accessory. For our uses, we are able to get all 4 of our cameras, the light shield for the primary into the large compartment, as well as the chargers, mics and video cables for all 4 into the small compartment, plus we can put our travel computer into the back. The weight of the backpack, on the other hand, is slightly heavier than one might expect. Empty, it feels heavier than it should, but even when the backpack is full, it doesn't feel like it contributes to the weight of the equipment. Because of the fact that the entire inner compartment is adjustable, it means that the DKS-20 is compatible with just about any camera configuration you might have. Because of the size of the main compartment, the only item that might be a problem is a large telephoto lens, simply because the lens itself is larger than the backpack. Otherwise, the backpack can hold just about any accessory, including a tripod, with ease.